Good morning, my friends! Welcome to the weekend, to the glorious luxury of Saturday mornings, and to a little bit of needlework news! These are random bits of embroidery or needlework-related news, information, instruction, and inspiration pulled from hither and yon for your weekend browsing. The way it works is this. I’ve fixed myself a nice cup of tea (it’s actually a fairly substantial mug) and I’ll end the list when one of three things happens: either my cup is empty, or my tea is cold, or I’ve run through my list of bits and bobs! So pour a cup, pull up a chair, and let’s go for a little browse together, shall we? So, I started actually doing Instagram with any regularity just last year. If you’re there, you can find me here: @needlenthreadmc. For those who don’t know, Instagram is a kind of photo social networking site that allows you to post photos of your stuff, but it doesn’t involve a lot of out-linking to other sites. It’s a great place to connect with other embroiderers, needleworkers, artists, and whatnot. I’m finding a lot of really inspirational embroidery on Instagram. It’s definitely worth exploring embroidery on Instagram, especially if you’re in a creative slump. If you’re on Instagram, look me up and let me know you’re there! I’d love to see what you’re up to! The last couple weeks, I’ve had goldwork on the brain, because I’m tacking a couple pieces this year. And so I’ve been noting notable things to share with you. For example, do you know about Garibaldi’s Needle Works here in the US? They stock an impressive array of goldwork threads, as well as kits by Alison Cole (for those who want to avoid overseas postal charges), and other goodies. I’ve not tried their hand-dyed (colorfast) linen yet, but I ordered some, because I want to do some landscape-y type stuff, and it looks like a good place to start. Anyway, if you’re in the US, and you’re looking for goldwork threads, you might check them out! Learning Goldwork – 17th Century Style! …And if you love embroidery, history, deep learning (as opposed to skimming! ), and you want to make a real investment in your pursuit of needlework and all of the above, have you thought about the Thistle Threads Goldwork Master Class? There are a few spaces left in the class – which is an online class stretching over 18 months – and it is a really thorough class! It includes all the supplies, historical explanations, explorations, references, and techniques, all the instruction, and at the end, you have a truly magnificent sampler of techniques that you can use the rest of your life. I’ve wanted to take this course for a while, and each time it comes up, I’m double-tempted! So I thought this time, I’d double-tempt you, too! I’ve heard great reports about it, so if this is your stitching Thing, check it out! …as Henry VI would say. Big news came out this week about the Bayeux Tapestry going on display in the UK. This is big news, sharing that piece of cloth across the Channel. I’m eager to watch this whole process unfold. I think it’ll be logistically interesting. It will apparently be a good five years before it happens, which gives you plenty of time to plan your trip to Britain and your Tapestry visit. Right now, a lot of stitchers are suffering from Winter Hands and asking for help. I’ve written about my dry hand routine here, for those who have been asking of late. Ever since eliminating pump soaps, I’ve not had as much of a problem with dry, chappy hands. My sister recently suggested I try Corona Ointment, which is used on horses, but I haven’t done that yet, since what I do works. Anyone ever use Corona Ointment for winter hands? Might be something worth looking into – but like I said, I haven’t tried it. I love this article on The Crewel Work Company blog. It features details about Ardverikie House in Scotland, which is a location that shows up in the last episode of season two of The Crown. Couple that location with scones and tea and stitching, and just who wouldn’t want to go? In any case, here’s a neat article on the Unicorn tapestries at the Cloisters. Another newsy bit that struck me recently was this article about a gal who reconstructed a butterfly wing so that a monarch butterfly that lost its wing could live out it’s short life and do what butterflies do. Had the wing been embroidered, I suspect it would have been too heavy. But I thought it was pretty amazing that it flew! The RSN opened up registration for their US summer school in Lexington, Kentucky, this summer. I had initially thought about it, but when registration opened up, there wasn’t anything that really grabbed me enough to justify the expense of the tuition, plus travel, plus housing / meals. That said, I think the experience will be great for those who can afford to do it, and who find a class that really interests them! I’m a little disappointed that it forces class-goers into a 5-day experience, instead of a choice of taking just the three day or two day classes offered. I do think the limited number of class participants is a terrific thing, though! We have several places in the US that teach world-class embroidery, too. There’s the San Francisco School of Needlework & Designs, where you can learn from RSN-trained tutors, on a regular schedule. And there’s the Williamsburg School of Needlework, which often hosts tutors from Hand & Lock for workshops. We also have regular Embroiderers’ Guild of America regional and national seminars with workshop that involve fully qualified teachers in all techniques. They also bring in tutors from around the world – like Jane Nicholas, Allison Cole, Tanja Berlin and many others. If you’re keen on taking classes and moving your skill set forward, it’s definitely worth getting on the EGA list, perhaps becoming a Member at Large, in order to keep up with the news. Some Nice Online Needlework Books! If you have time this weekend, explore these old needlework books! They’re online, they’re fun, and they’re free! And you an always download them to your computer or tablet to explore later. I hope you enjoy your weekend! May it be full of memorable moments – all in a good way, of course! I’m finishing my second mitten this weekend. I’ll show them to you next week! 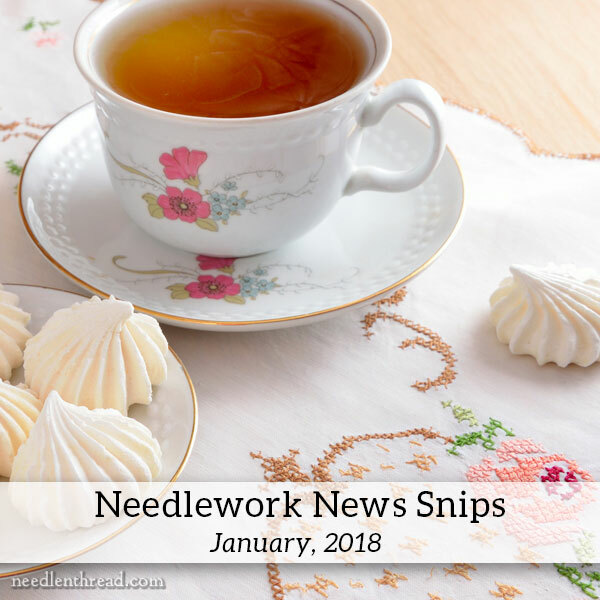 December 6, 2017 Needlework News Snips for December! A lot of interesting news snips. I also read that the Bayeux Tapestry is coming to the UK I’m really excited about that. If only I could afford to go on one of the Crewel Work Company highland holidays they sound so exciting. Thanks for all the news snips and for sharing them with us. I hope you manage to finish the second mitten, happy stitching. Thanks, Anita! Strangely enough, the second mitten is not coming out quite as well as the first. I think I’ve not been as careful with the stitching as I was on the first one, because somewhere, deep in the recesses of my mind, I was thinking “Well, this one should be a breeze….” and then I just didn’t pay as much attention! In any case, we shall see! Yes, the Crewel Work Company journeys are definitely what I’d call “the trip of a lifetime.” Definitely a dream destination! I love when you do your snips except for the fact that I lose hours exploring them all. I recently found Garibaldi’s Needle Works. They also have an Etsy shop. On the Etsy site they reference DMC thread color numbers so you can actually see the true colors of the fabric. I ordered two pieces of 40 count Newcastle linen. They look beautiful. Shipping was much quicker than stated but we are both in Michigan so I’m sue that helped. I haven’t used them yet because I’m waiting for my first pair of evertite stretcher bars to come in. I’ll let you know how they stitch if I ever receive my bars. Hi Mary…my husband has used Corona over the years which does work well. It’s quite thick, so, it is more or less a bedtime application. I second pure lanolin – it is the absolute only thing that works on my chapped lips! Weleda Skin Food is a great hand creme and shouldn’t be that hard to find. Though it’s a little pricey, a tube should last most of the winter. It’s what I’ve been using when my normal go to (Badger Balm) wasn’t moisturizing enough- it was fine for when I lived in Maine but I’m in Iowa now, where it’s much drier. One of my Christmas presents was a replacement of my Conair beauty mitts. I slather on Loccitane Shea moisturizer and Barielle nail cream, pit my hands in clear plastic bags, insert hands and bake. There’s an auto shut off after an hour, so I bake for about 45 minutes. When I’m done, my hands are a little slimy yet, I rub that in. On the next hand washing, I don’t feel like I need to cream up. It also helps with the arthritis, which I have a touch of. By the way, there are disposable plastic liners available, usually used for paraffin dipping. I use this one places produce bags. They’re sturdy and plain. I wouldn’t use the ones with printing, because you don’t know what’s in the inks. And that brings me to a question. I love the idea of taking classes, and I’m so near to San Francisco, but I need to take frequent breaks from stitching to flex and stretch. Are they accommodating to these things? I’ve taken a few quilting classes and the first one was wonderful and the second one put me off classes. No one can sit hunched for three hours. Hi, Jean – I haven’t taken a class at the SFSNAD, but I’ve chatted with the folks there a bit, and they are very nice. I’ve also heard great reviews from folks who have been. I can’t imagine that they would protest to stretch breaks. In fact, in situations like that, I think it’s good to remember that you’re the paying student – if you need to take a break, you just need to take a break. And while it could be disruptive to your progress, that type of break really wouldn’t be disruptive to a whole class, so I can’t imagine there would be a problem. Maybe we could drum up a get-together of Needle’n Thread enthusiasts in the UK up until then? That would be great! Hey Mary Thanks for those book to download and read! (the old ones). I love reading them. And they still make perfect sense. Thank you. I sympathize with all who suffer from chapped hands in the winter. I’ve spent the last 40 some years slathering lotion on my hands (I liked Neutrogena the best) and using rubber gloves to wash dishes, with only moderate success. I tend to wash my hands way too often, probably the cause of my problems. However, this winter my hands are so soft you’d think it was August. I have never, ever, ever had such soft hands mid-winter. I’ve stopped using hand lotion and rubber gloves. The only difference this winter is I’m using AFRICAN BLACK SOAP. It was given to me. I’d never heard of it before. It’s a liquid, actually brown not black, otherwise just like any other liquid handsoap. The brand I have is Alaffia, and it came from Whole Foods, but there seem to be many brands and sources. It’s a bit pricey, but I’ve stopped using hand lotion and rubber gloves, so I’m saving some money there. I’m totally hooked. The packing says it has shea butter and palm oil in it, so I’m guessing those are the magic ingredients. I have never used any product that worked so well. The one I have has a pleasant, low-key lavender scent (I hate the scent of most soaps, but I like this one). I highly recommend this soap. It’s miraculous. On another note, I found a beautiful photo of an embroidered pillow in my Instagram feed from the Philadelphia Museum of Art. I loved Garibaldi’s. Just bought some linen and some even weave from them in luscious colors. It’s too bad that the RSN did not have photos of the actual completed projects for too many of the classes. The ones that had great photos sold out immediately ( I am going). I do think the 5 day Gold and Silk has the potential to be spectacular as does the 3 day Queen’s Silk. Several of the classes were hardly worth the effort. I think this first effort to expand, especially during regional seminar season was a little under developed and hopefully they learn about the extensive seminar offerings available here in the US, unlike the UK where they are just about the only game in town. I would like to see them succeed as the quality of their instruction is spectacular. Yes, I saw few classes that have the potential to be really spectacular, but many of them (the stumpwork one comes to mind right off the bat – especially considering it’s a full five day class) don’t look quite worth it, for the price! I always look forward to reading your news and catching up with your projects. Like you, I started with cross stitch but have now done some crewel work, white work an black work project. As a gardening and DIY enthusiast, I see my hands as tools; hence, they are often rough and chapped. I started using O’Keeffe’s Working Hands, hand cream. Best stuff ever. Just apply at night and hands will be good all day, without needing further applications and that slightly sticky feeling, I loathe. With the cold dry winters we get in Southern Saskatchewan, our hands get very chapped. So, the ladies in our Stitchers group use a non-greasy product called Udderly Smooth Hand Cream, which was originally developed for use on dairy cows. We simply apply the cream, wait a few minutes for the hand cream to dissolve into our hands and pick up our hoops. For your “Winter Hands” have you tried “Bag Balm”? It was originally created by a druggist in 1899 in Vermont. It was used by farmers in that area on their cow’s udders after milking to keep the cows udders from chapping in the cold harsh Vermont Winter weather. The story goes that the farmers’ wives noticed how soft their hubby’s hands were after they applied the “Bag Balm” to their cows…so the ladies started using “Bag Balm” on their hands as well. “Bag Balm” ingredients includes an antiseptic (8-hydroxyquinoline sulfate 0.3%) in a petroleum lanolin base (I just copied that from the container that I own!). I first learned of this skin softener when I was a member of a quilt guild a few years ago. The ladies of the guild claimed that they used “Bag Balm” to soften skin on their hands (especially when sewing), but also it works on chapped lips, rough elbows, baby’s diaper rash, callused feet, and lots of other “stuff”! I buy “Bag Balm” in the 8 ounce tin at Walmart! Hi Mary, I’ve been won over not just by the colour range of Garibaldi’s Needle Works’ hand dyed fabrics but by the names they use!! “Cinnamon Toast”, “Hot Chocolate”, “Granny Smith Apple” and “Pomegranate Plunge” are great names for fabric colours. Now to put on the jug!! Fascinating on the butterfly wing repair. I had always heard “don’t ever touch a butterfly wing because you’ll damage the scales and it won’t be able to fly!”. Looks like another myth down the drain – the guy in the video didn’t seem too concerned about it. Do you know about Seams hand cream? Specially designed for people who sew. https://www.seamsbeauty.co.uk/product/hand-cream-75ml/#.WnjMf5M-cWo I have not tried it yet. I do like Lavera foot cream, as it gives a dry finish, not greasy. Sounds like a wonderful product! I’d love to hear what you think of it! Have now tried the Seams and it’s very nice. I had rough fingertips, especially the index fingers, and those now feel completely smooth (I’ve used three thin applications today over the course of a few hours). It absorbs readily and is non-greasy, and smells a bit like soapy lemon floor wax(!). Much better than the Yardley hand cream I was using. Usually, my fingertips are the one thing that hand creams don’t help. Thanks for writing such a lot of amazing articles to do with embroidery, I am an avid Embroider, I walk, eat, work and sleep embroidery, sometimes I just don’t know how I find the time to do it all. Oh yes I barely do the house work my Husband does that side of it all, and the Garden well, I will have to get a helper in for that, my time is too precious. 13 July through to the 19 July 2018, where we will have a lot of well known Embroideries like, Phillipa Turnbull, Hazel Blomkamp, Merrilyn Heazlewood, Alison Snepp, Yvette Stanton, Christine Bishop, Margaret Lee, Gary Clarke, Jane Nicholas, Jo Dixey, just to name a few, I am looking forward to this week. Most of the classes are full, so we feel the Conference will be a great success. Not sure where the next one will be held. Next Next post: Embroidered Wool Mittens – One, Anyway!